Fifty years after Andy Warhol presented his pop art series of 32 Campbell's Soup Cans to the world,Campbell's today is paying tribute to Warhol's iconic work by introducing a limited edition cans of Campbell's condensed tomato soup .Campbell Soup Company never commissioned Warhol to paint the original soup cans, he found his own inspiration from the classic red & white Campbell's label, A soup , he consumed quite a lot, apparently.Andy Warhol first exhibited these 32 canvases in 1962, each one hung from the wall like paintings and rested on a shelf like groceries in a store. The number of canvases corresponds to the varieties of soup then sold by the Campbell Soup Company. Quoting one of Warhol's famous rants "But I always say, one's company; two's a crowd; and three's a party ". Well, let's get the party season under way, with These Cherry Gazpacho , perfect as an appetiser for your party using Campbell's condensed soup and a few bit & bobs from Lidl . 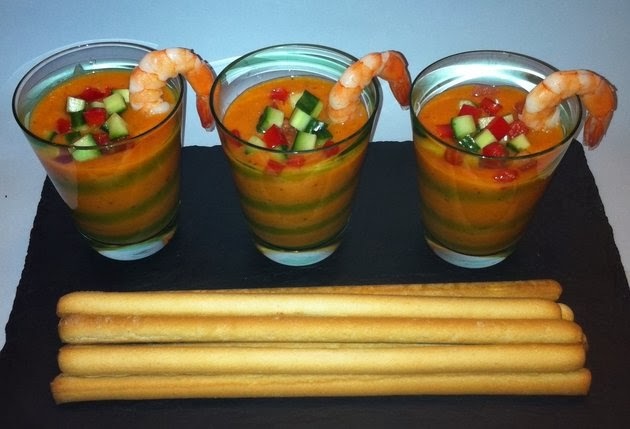 Gazpacho is usually served cold, originating in the Southern Spanish region of Andalucia. 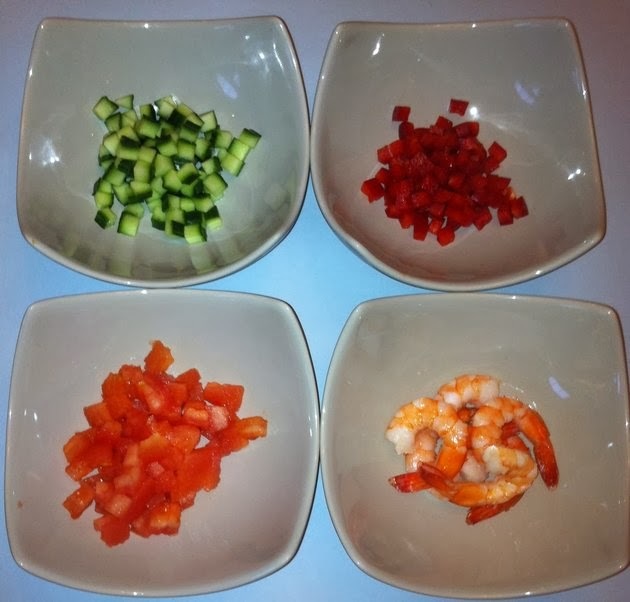 Traditionally, gazpacho is made by pounding peeled and deseeded tomatoes in a pestle & mortar, as this method avoids the surplus of foam and discolouration created by blenders and food processors. In addition, to the puréed tomatoes, garlic, shallots,cucumber, olive oil,salt, vinegar and soaked bread ( for a really thick consistency )and iced water. Here is a smooth and elegant variation of this chilled soup. Serve it on it's own or garnish with a fine brunoise of vegetables/ cooked prawns/ crab meat /cray fish / lobster /crisp bacon strips / avocado, green chilli&tarragon along with some bread sticks or crostinis. And my version also involves chilled Vodka. Well , it is a party , after all !!!!!!!!!!!!!!!!!!! 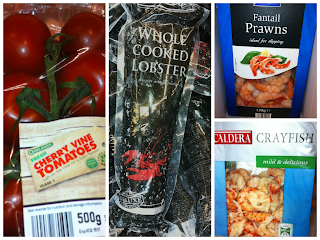 1x pkt of Cooked fan tail Prawns , 150 grms @ €2.99 for 150 grms , Cray fish €1.99 for 125 grms. & whole cooked Lobster for€5.99 for 350 grms. Roughly chopped the Cucumber, red pepper , tomatoes & shallots. Pulse in a food processor. Add the condensed tomato soup , garlic, lemon juice,sherry vinegar, tabasco, vodka,and ice cubes. Pulse until well blended. Season to taste with salt and pepper. Chill until needed. The longer the gazpacho sits, the more the flavours develops and vodka is great for absorbing other flavours. Garnish with finely diced red peppers, cucumbers, peeled tomatoes & cooked prawns . To peel the tomatoes , make a x cross at the bottom of the tomato and drop them in boiling water for 1 minute or less until the skin blisters. Take out and refresh in chilled water to stop the cooking process .The skin should come off easily. Cut the Cucumber in half and with a tea spoon , you should be able to remove the seeds easily. Leave the Vodka in the freezer, it won't freeze and you will require less ice cubes.